That's all for now: just a good day. Oh, and I stopped for an accident, with my collar on, but luckily wasn't needed. Most important was a 2 hour sleep in the morning. Poor Moo had a long drive to Peterborough, but I made the most of the morning, and it really helped. I had a work call around redundancy issues in the afternoon which went as well as could have been expected, and when Moo came back, we put the girls to bed and then barbecued. Since then I've been getting up to date with the blog entries, wrapping up a day of catching up with post, email photo-posting and the rest. It still feels strange, and a bit different, but it feels right. (backposting) So much to blog about. So much. But I'm still processing it, so I'll put down what I can. We arrived at the church early, and it was lovely to greet people as they arrived. 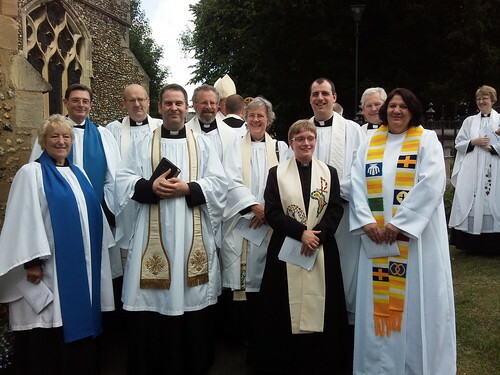 I had problems letting go, and not being the curate: there were other people to sort things out, and in the end, I just had to be an ordinand, get ready, and go with it. I robed up in cassock, surplice and white alb - a beautiful 18th century white alb that Dad had been given for his priesting, and which he passed on to me. We formed up in the St Andrew's Centre car park, and then walked over to the church. Moo was my lay sponsor, and I held her hand as we processed up the aisle together. 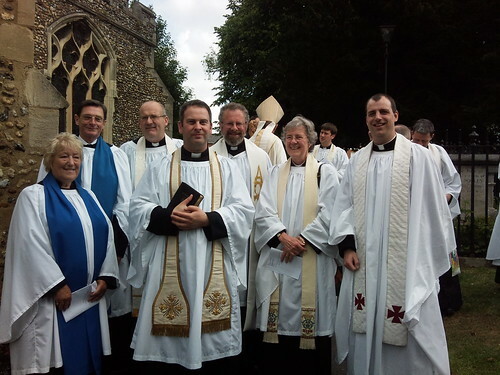 There's a fair amount of preamble - all of it important - before the actual act of ordination, and I was the third of the 3 to be ordained, but in the end my time came. 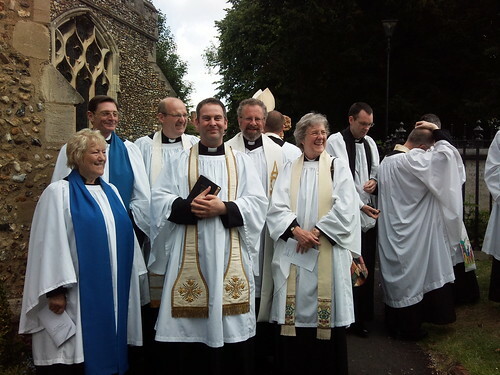 I knelt in front of the bishop, and the clergy clustered round and laid their hands on me. There were 10, I think: the bishop, the bishop's chaplain (Tim), the preacher (Chris), my father, my incumbent (John), Geoff (from the team), Viv (from the team), Mark and Ian's incumbents and James (a good friend, and previously from the team). Moo says it was a big of a scrum, but I couldn't tell. As the bishop said the words, it felt heavy, and I felt surrounded, and it was good. And then, I was a priest. The bishop anointed Ian's hands, then Mark's, and then mine, and we were done. The service moved into a Eucharist, and we stood to either side of the bishop as he presided. After we'd taken communion from him, we got to sit down and just relax a bit. The service finished, the bishop took us three, new priests, down the aisle, and it was over, and time for some pictures. The parish put together a fabulous bring and share lunch: what lovely people. I had a chance to catch up with a few of them, but also friends and family. Leo, Rosie and Andy, Mark and Jenny, Mum and Dad, of course, Aunty Les and others, too. Si and D arrived in time for the 1500 Eucharist, as did Gary with his family, which I'd not expected. I walked the main players - Dad (serving for me), Sally (reading the Gospel) and Ian (preaching) - through the choreography first, and then it was time to start. It was an immensely emotional experience for me. Mum later said that the first time she'd seen me cry in church was 31 years ago, and she thought she'd see it again, and it was close. Some of the liturgy, a couple of the hymns, and also parts of Byrd 4-part all had me close to tears. But when it came to the two parts which mattered the most to me - the Absolution and the Eucharistic prayer - it all worked. I'd been worried about the Absolution, but it felt right. Even more so for the Eucharistic prayer. I'd spent a lot of time preparing, and in particular thinking about the actions and gestures that I'd be using, before deciding to go with pretty much the bare minimum. I was boiling in a warm chasuble in a very warm church (Catherine had needed to call an ambulance for a member of the congregation at the ordination service - though I'd not noticed! - and the afternoon was hotter), we had a gospel procession, a Latin mass setting, and pretty "high" setting, but the theology is pretty low for me. When it came to the prayer of institution, it just felt right to be saying it. And I was just aware that I was not the first person to be saying these words and celebrating this feast, but was part of a long tradition, made up of many, many others. It was just right. And Dad hadn't realised that he would be the first person to whom I administered communion, and that was very special indeed. Our last hymn was "Jerusalem": a mission hymn. And, although not everyone enjoyed it, we had my favourite piece of organ music: "Dieu parmi nous" (God among us) by Olivier Messiaen. We sat, rather than processed, and it was the perfect end to my first communion. We finished the day with friends coming back for a barbecue - during which it rained very, very hard. Si and D with Morgan and Boo, James and Ruth and Sally all came, and John and Mo arrived later as the others were departing, giving us a good chance for a chat with them. The girls pleaded tiredness around 1900 and we put them to bed without even a bath, and they were down so quickly that we had a good long time to chat. A good end to a long day, and we went to be tired. Only for Jo to turn up with a temperature (I took her into the spare room with me) and Miri to go in with Moo, having been woken by Jo's perambulations. Such is life. (backposting) Decided not to go for any walks today, but to let the blister heal - I'll be in formal shoes for the big day, and don't want to be distracted. Also, it's an opportunity to do some quiet reading and catch up on some sleep. Chris, the retreat leader, has spoken brilliantly, and given us lots of food for thought, and it was good to see him in the pub tonight, where I had just the one pint and a J2O before heading back for an early night. Well, it would have been an early night if it weren't for the village party with rock & roll band, who kept going till around 0030. Oh well, at least I slept during the day. 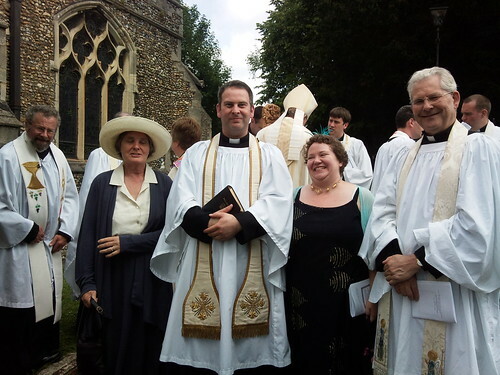 It's very odd to know that tomorrow I'll be ordained priest. I'm ready, but it will be a big change, and I've been reflecting how the change also brings particular changes in responsibility in with regards to leadership. As a deacon, you're called to serve, first and foremost, but as a priest, you're also called to lead, and that's a big change. I'm not sure how that's going to be lived out in my life and ministry. (backposting) Ages since I had a blister, but after two walks, coming to around 6 miles, in sandals which are beginning to fall apart, I managed to develop one. Luckily, the weather's so warm that I can walk around the retreat bare-foot most of the time, and the people running the retreat centre had some special blasters which I can use. The second walk was with a good friend, Sue, and it was good to catch up with her, to share our thoughts about priestly life, our children, our jobs, and the rest, while walking through the fields and woodland around the centre. The retreat's going well, and I managed to get some sleep in the afternoon. Last evening staying late at the pub tonight - not sensible to stay up the night before the big day. (backposting) I spent much of the morning tracking down the original CDs for the music I want at my first Eucharist: Byrd 4-part Mass, Ley's setting of the Prayer of King Henry VI ("Domine, Iesu Christe") and, if we get the time, a couple of Purcell motets. Also, writing the directions for Jim, who'll be in charge of it all. Trying all that out, packing and doing a little tidying around the house took me up to setting off to Pleshey for the pre-ordination retreat. I was, by a few minutes, the first to arrive, and set off on an 80+ minute walk, using AFTrack to record where I went, ready to transfer the details to Openstreetmap at some point. I got pretty badly stung by nettles, but it was worth it: I walked 6 miles or so, I think, through beautiful countryside. Towards the end, a young fox walked out onto the path in front of me, downwind, and followed it for a few metres before crossing into the undergrowth to the side. Just something to treasure. And so to the retreat. Good to get together with some good friends again, and, as usual, the "silent" bit of the retreat is somewhat relaxed down at the pub. Time to rest, get into the right frame of mind, and ready ourselves for Sunday. (backposting) Tomorrow, the retreat begins, so today is a day to get things sorted. I worked on a CD for my first Eucharist, and took it into church to listen to, but it didn't work so well, so I'll have to find an alternative way of doing it - hopefully I can find the original CDs and use those. After that, we had a team clergy lunch, most of which was not actually lunch, but the team walking through the choreography of the ordination service for Sunday. Just as we were sitting down to lunch, the plumber called, so I had to eat quickly and head off home. We now have 3 working loos, rather than one and a half (no, really). This is an improvement. Today, I cycled 13 miles, walked 6, and had a bath, which is basically a triathlon, isn't it? A ten-mile bike ride, having pumped up the tyres with my new stirrup pump (Father's Day present). Nice to be riding it again - I started at the end of the autumn, I think - getting the pump (which I'd asked for) was an incentive to get back into it. 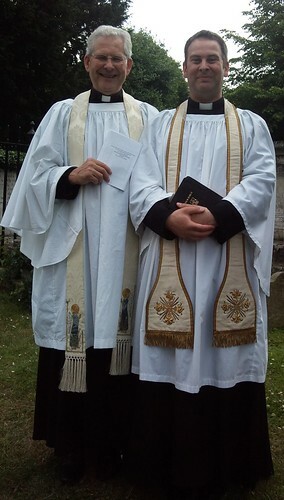 I also had quite a long session with my incumbent, John, where we prepared for my first Communion service on Sunday. We walked through the whole service, and had lots of discussion about various aspects. The bit we spent most time on (unsurprisingly) was the Eucharist prayer, and in particular the gestures that he uses. I'd previously spent quite a lot of time talking to my Dad about what he does, and we also had discussion about it during the CME day the other week. Part of the discussion, I'm pleased to say, was about the theology being expressed by the gestures, and John is very happy for my practice to be different to his (as is my Dad). I'm pleased to have spent so much time thinking and talking about this: I'm sure my practice will change, but it should be firmly based in my theology. As part of the walk-through, I said most of the service. It was interesting to note which bits of the Eucharist prayer I didn't want to say. It was also interesting to note that I think that I'll find giving the Absolution for the first time as affecting, in its own way, as my first prayer of consecration. It's going to be a very emotionally charged day on Sunday, but I'm looking forward to it very much indeed. Today I baptised Si and D's daughter, Boo. After some discussion, they decided to be brave and to include her nickname "Boo" in her baptism, making it official, so her name is now "Charlotte Phoebe Boo". I preached on Ubuntu theology, and "I am, because we are" (rather than the "I am, because you are", which I'd found yesterday online). We started with a clapping game, with 5 different rhythms, building them slowly on top of a simple 4 beat (thanks, Chris, for helping with this one), and I then talked about the catholic nature of our faith: not only was I baptising Boo into the universal church - not any local church - but we must remember that our salvation through Jesus Christ is not just an individual salvation, but also a catholic salvation. Christ died for us all. We had a lovely afternoon eating, drinking, chatting and the rest, and the girls did really well. And now they're in bed, and we're watching Karate Kid. At Moo's suggetsion, I listened to the podcast of a recent Beyond Belief from Radio 4. It was about dementia, and how religions - and their adherents - deal with it. It was excellent, very thought-provoking, and extremely moving. I came across the phrase "Ubuntu theology", in relation to Archbishop Tutu, and it really struck a chord. I'm aware of the word "ubuntu" because I use Ubuntu Linux, and its overtones of community, but Ubuntu theology, which apparently was formed at least partly in response to Afrikaaner theology which was defending apartheid, has been summed up by Tutu as "I am because you are". This works very well for a sermon I'm going to be preaching at Boo's baptism. I've been wondering how to centre it, and now I know. (backposting) I could have done with more sleep, but I did OK. I was beginning to stream with the cold, and had stuff I really needed to be well for, so took a sudafed. I'm not supposed to do this as I've got hypertension, but I decided I wouldn't die from just one (in fact, I decided that my head wouldn't even explode a little bit, and it didn't). I had a good day, anyway, and it was worth it. I'm very keen to debrand my Samsung i8910 HD and take lots of Orange stuff off it that I have no interest in using and which apparently slows it down nicely. I'm not very well today - not yet man flu, I'm Just A Little Bit Poorly[tm] - and I have the day off tomorrow, so Moo has banned me from doing it tonight. We're watching Outnumbered and laughing lots. It's just too like our family, and Karen (the little girl) has this relentless logic which reminds us scarily of Jojo. And the complete incapability of the adults to manage the kids without lots of bribery and compromise. That's us. Oh: the diocese finally told us about the pre-priesting retreat today. It is on, after all. I've been feeling like I've been coming down with something for a while, and haven't been feeling great today. It's just a cold, and as a bloke I don't like to go on about the sinuses, headache, loss of voice and the rest. So I won't, natch. Had my car serviced. Ooh, it's expensive, isn't it? Work's been busier than late: a possible customer with lots of questions. Keeps me on my toes, I guess. (backposting) Took the girls to church in Halstead today, which they enjoyed. It was a family service, and therefore pretty child-friendly, and also quite short, which helped them. In the afternoon, we all went swimming at the Freeport pool in Braintree. Jo learnt to tread water, which is a useful skill. In the evening, I went for a good walk. I'm trying to work out what to do about my first Eucharist on the 28th. I really want to have parts of a Latin setting of the Mass (well, Greek, if you include the Kyrie), and to have a really serene service. But the more I think about it, the more I'm worried about not making the service child-friendly. I'd really like Jo and Miri to be able to be there, but there's a tension there with the style of service. This is something I need to decide pretty soon. The weather's been good, which is excellent. Went to get another gas canister for the barbecue (the last one ran out yesterday) with Miri when Jo was at ballet. And went for a bacon and sausage sarnie, obviously. And wandered around Clare church, which Miri loved. Lunch, bikes in Clare Country Park, Si, D., Morgan and Boo around for a barbecue this evening. Good to see them all, and sardines in the garden is a whole lot more fun than with just 4 of us. Particularly when Miri keeps shouting, "hiiiiiiiiiiding! Heeeeeeeeeeeeeeeere!" Got "MikeCamel" as a username for Facebook: http://www.facebook.com/MikeCamel. I've had the same nick for around 14 years now, so it's nice to keep it. Moo doesn't see the point: neither does D. Si does, natch. Oh, and have you any idea how difficult it is to find a (working) Bible reader for an S60v5 phone? Dull. (backposting) Bad nettles, bad brambles. Be dug up! Be destroyed. Jo went out for a ballet show this evening, which left me and Miri for bedtime (Moo took Jo). Miri loved it. A CME session this evening in Chelsmford. It was on Fresh Expressions, or "the mixed economy church". There wasn't much that was new, to be honest, but it was good to see folks (and have a lovely supper). I decided that today would be a very good day to tidy my office, but luckily some things came up which distracted me. Oh, and I've got a silicone case for my mobile phone, which I'm pleased about, as it's a little less vulnerable now. (backposting) I had a wedding preparation this evening, in a pub, which seems like a good place to have it. And towards the end, we started discussing baptism. The couple have two children, and want to have them baptised some time after the wedding. And, after some discussion, it turned out that the bridegroom would like to be baptised by them, as well. I was really, really pleased. Oh, and I sorted Moo out with Goosync for her new phone, and managed to transfer all the old diary items and contacts from her old one and her Palm, so she's very happy. (backposting) Trying to remember what I did today. A bit hazy. Moo's coming to terms with her new phone, I guess. Hmm. Lots of things I can't really blog about today, including some pastorally sensitive ministry-related activity, but it's been a really good day. We also had our first parents' evening for Jo's school, which was exciting at one level, and administrivial (is that a real word) on another. Had a good walk, too, and Moo's got a new phone, the sim of which will be activated over night. She has a day at home tomorrow, so she's quite excited. It's the one everyone worries about: preaching on the Trinity. Either it's easy to explain - and impossible to understand - or it's impossible to explain - and easy to understand. That's received wisdom, anyway. I was preaching in Colne Engaine, to a family service which a fair percentage of children. I ended up preaching analogies - and noting that they're both useful and near useless. I used a few analogies, but my main one was cake. It's currently getting a bit of retweeting, which I'm quite chuffed about. The analogy I used was that the Trinity is a little like cake, in that you need ingredients, cooking and eating: they're all separate parts, but they're all required. I said the same about a conversation: you need a speaker, a listener and meaning. Or a song: music, words and singing. It all seemed to go down rather well, and I was quite pleased. Jo was very sad when Mum and Dad went - lots of tears. So we went swimming, and had a lovely time. Kids went to sleep nice and quickly, and we're having a quiet time watching an old West Wing episode before going early to bed. Dad and I took the girls to The Imperial War Museum Duxford. We had a great time, and the girls didn't seem to mind it too much, either. In the evening, I cooked a side of salmon on the barbecue. Lovely, lovely. (backposting) My parents are still around, and it's lovely to see the girls getting to know them properly. It's partly that Miri is now old enough to get to know people other than her parents (that'll be us). And best of all, after the girls had gone to bed, they babysat while we headed off for a meal at The White Hart in Great Yeldham - and they stood us the meal. It's so good to spend time together, even if we were feeling too honest to let them forget to charge us for the wine. In 24 days, I'll celebrate my first Eucharist. We had a CME day today to help us prepare. I had some issues with at least one of the speakers - a "Forward in Faith" priest who referred to the Pope as "the Holy Father", said that he's the only true vicar, and admitted to using the Roman Missal (completely illegally), but had some other good theological points - but it was a very useful day. Afterwards, my parents arrived to spend the weekend with us. Dad (who's a priest) had written me a letter in preparation for my first Eucharist which raised a number of the questions we'd discussed today, as well as some others, and we had a good discussion about a number of them. More to come, I'm sure. And Dad gave me a white stole. He gave me one for my deaconing, too, which his mother had given him. But this is a C18th stole, with gold thread, and is just stunning. I think I'm going to wear it for my ordination, and ask him to wear the other one which he gave me. Really - it's beautiful. When I got up this morning, my muscles - particularly the gluteus maximus on each side - were suspicious. I've therefore been careful not to overdo the work they've had to do today, as I don't think that they'd be very appreciative, and might refuse to do anything for several days. This is fair enough. I had a good spiritual direction today: interesting discussion about where my gifts lie, and how best I can use them. I love engaging intellectually - from the pulpit or in written form - and my spiritual director said that the place where he's seen me be most effective is in pastoral situations. That doesn't mean they're mutually exclusive, but it's certainly food for thought, which is part of the point of spiritual direction, of course. managed to get _very_ cool GPS app (AFTrack) working. It's very impressive indeed, and apparently works with the lovely Openstreetmap, though I've yet to try it out. enjoyed watching the girls playing outside: colouring, splashing in the paddling pool, etc. A good day - and I really enjoyed the walk. (backposting) Barbecue's still great. The girls are still enjoying themselves, and we're still enjoying them. Trying to find a good Symbian Bible app for my phone (a Samsung i8910 S60v5), but am failing somewhat.